Polaris Rangers. How To Choose the Best Ranger UTV For You. 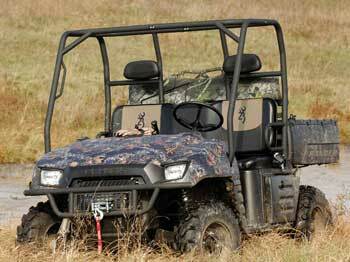 Find Out if Polaris Rangers Are the Best UTVs in This Exclusive Report. What is the best UTV? Are Polaris Rangers the best? Those are the questions our exclusive new report will attempt to answer. The Polaris Ranger line includes several models, so let's find out what we're dealing with first. Polaris Rangers - All Models. Ranger 500 Series - The 500s come in two flavors - 2x4 and 4x4. 2x4 - The base 2WD 500 will put you in the seat of a UTV for under 8 grand. Have too many features been stripped to hit that price point? Depends on what you need a UTV to do. If you can live without 4WD, this model has a lot to offer. The biggest sacrifice is trading the fuel injection for a carburetor. In the real world on a vehicle like this, it's probably not that big a deal. What could be a big deal is the feature Polaris calls SpeedKey. It's really just a switch that limits top speed to 25 mph. That would be a great way to get started teaching your kids to drive before you put them on the streets with all the crazies. These Polaris Rangers can still carry 1,000 pounds and tow 1500. It still seats three adult size people. Plus you get an independent rear suspension with an electronic locking differential. Handy if you drive on terrain you (or your better half) don't want damaged. Only you can decide if you truly need 4WD. I think that may come down to some self examination. Kinda like a lot of SUV drivers in my home town that think they need 4WD because it snows once every few years. 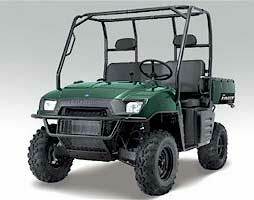 4x4 - Dealers for Polaris Rangers tell me this is their top selling model. When folks vote with their checkbooks, there's usually a good reason for it. Probably because this model does more of what most people need to do. The On-Demand 4WD system is the slickest of all UTVs to date. Easier to engage, works almost instantly when wheel slip occurs, and gives you full AWD. On the trail, it can be the difference between getting stuck or breezing through a natural obstacle course. The push button locking rear differential is another feature that often gets overlooked, until you need it. It allows you to maneuver in tight quarters or tighten your turn radius where other UTVs just wouldn't make it through. It can also keep the wife happy by not tearing up the lawn! Of course if you want to do donuts on the golf course - feel free. Power from the fuel injected, liquid cooled, 500 single gives a top speed of over 40 mph. Considering it will out haul and out pull most of the class, it's really amazing that it goes this fast too. If your need for speed is stronger, there's always the Ranger RZR. Before you get carried away though. I talked with several dealers and every one of them felt the Ranger was the best UTV for someone to start with. They said the performance level of the RZR was just too much for an inexperienced driver. Most felt that unless you planned to ride on 50" ATV trails, the Ranger was really a better choice anyway. Don't say I didn't warn you. There is another choice - the Ranger 700 XP. Guess it's about time to talk about the 700s. Ranger 700 Series - You have 3 models to choose from in the 700 line-up.Things start getting more serious now. Price, power, and capability all take a step up. XP - A 700 twin with fuel injection and liquid cooling push this baby to more than 50 mph. When you get tired of that wind in the hair feeling, hook it up and pull a full ton! I don't want to keep sounding like a Polaris ad, but there's just nothing else out there right now that will do that. You also get more electrical power with a 500w alternator. Now there's no excuse for not having a full row of top lights. Or you could always light up a Christmas tree at the camp site. 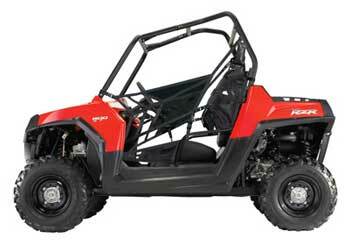 If you want more power and speed than the 500, but more utility and room than the RZR, the 700 XP should do the trick. 6x6 - Ever thought of equipping you own para-military force? You could start with one of these. Any other reasons for buying one of these Polaris Rangers? 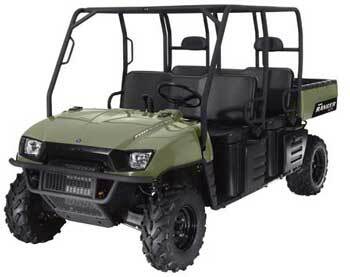 Sure, if you want the highest payload capacity, the biggest cargo box capacity, and the highest tow rating of any UTV. Several owners also brag about the 6WD system. They said that in situations that would stop their old 4WD rides, the 6x6 would make it through with no problem. Especially steep ledges and mud. Many mentioned better towing capability when traction was less than perfect. Those 2 extra driving wheels make a difference. Crew - The largest of the Polaris Rangers. Aptly named, this thing will carry 6 full size adults. I'm not even sure I know 6 full size adults, but that's another story. Anyway, it also has 29 gallons of under seat storage for all the stuff 6 full size adults need to carry. If you have your own basketball team, or just want to carry a basketball team into the woods and leave 'em, this is the perfect ride. Oh, and why not tow a 1 ton trailer while you're at it? You could. Still has all the features of the XP. Just say "Super Size Me". Admittedly, top speed is only 44mph, so you can't terrorize your buddies quite as effectively. But you can scare more of them at one time! Seriously though, if you really need to take more than 3 people with you, there is nothing else on the market that does it as well as the Crew. So now you can be that social butterfly and spread your wings. Ranger 800 Series - Ah yes, the Ranger RZR! The sports car amongst all Polaris Rangers. Actually, if you came here looking at Rangers, I suspect this may not be the machine you're interested in. If I"m wrong, just click on the link below to see our full report. So I guess it's time to answer our original question. Taken as a whole, I can't think of another line of UTVs that will do all the Ranger models will. Now that's not to say some other machines out there may do some things better, or more reliably. I just think it's easier to match your needs with one of the Ranger models available today. Tomorrow could be another matter. 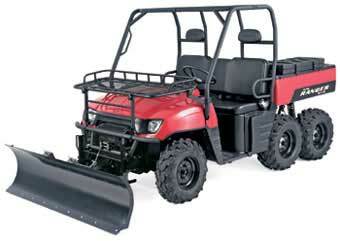 Manufacturers have figured out this is the fastest growing segment in the ATV world. Expect to be seeing a lot of new stuff soon. It should be interesting. 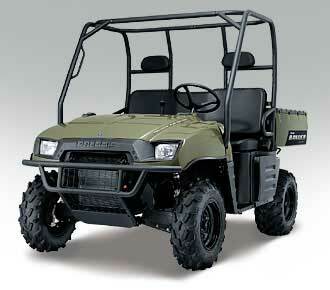 Polaris Ranger Accessories that are now available. Everything from bumpers, cabs, suspension upgrades, to turbo kits! You can turn a Ranger into just about anything you want. Polaris Razor S. New for 2009. Return to World of ATVs Home page.